AWOLNATION at Riverbend Music Center, Cincinnati, OH, 10/5/2016. Prophets of Rage at Riverbend Music Center, Cincinnati, OH, 10/5/2016. 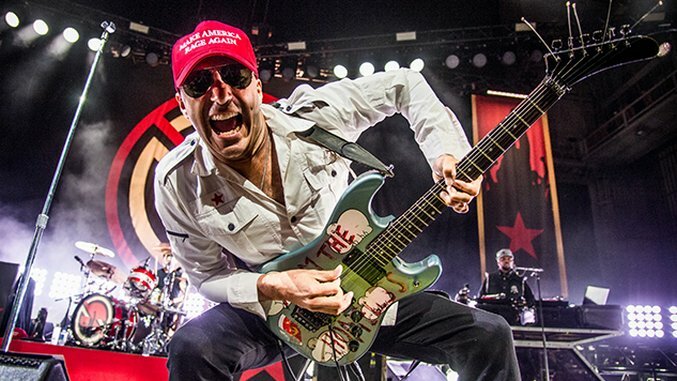 Though former Rage Against the Machine frontman Zack de la Rocha may be toiling on new material with his Run the Jewels buddies, previous bandmates Tom Morello, Tim Commerford and Brad Wilk are already riding out a tour under the Prophets of Rage moniker. A collaboration with Public Enemy MC Chuck D and DJ Lord as well as Cypress Hill’s B-Real, the supergroup released the EP The Party’s Over last August, a jagged mix of booming riffs and fierce verse. Amy Harris caught PoR’s Cincinnati show at Riverbend Music Center last week, capturing what looks like one hell of a show alongside opener AWOLNATION.